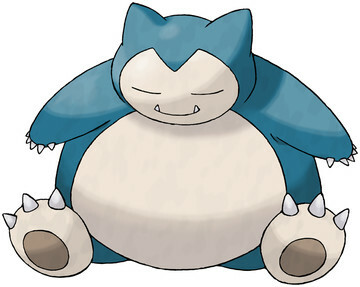 Snorlax is a Normal type Pokémon introduced in Generation 1. It is known as the Sleeping Pokémon . The effectiveness of each type on Snorlax. In Generation 1, Snorlax has a base Special stat of 65. In Generations 1-4, Snorlax has a base experience yield of 154. SNORLAX’s typical day consists of nothing more than eating and sleeping. It is such a docile POKéMON that there are children who use its big belly as a place to play. It stops eating only to sleep. It doesn’t feel full unless it eats nearly 900 pounds a day. Its stomach is said to be incomparably strong. Even Muk’s poison is nothing more than a hint of spice on Snorlax’s tongue. It eats nearly 900 pounds of food every day. It starts nodding off while eating—and continues to eat even while it’s asleep. It doesn’t do anything other than eat and sleep. When prompted to make a serious effort, though, it apparently displays awesome power. Snorlax learns the following moves in Pokémon Let's Go Pikachu & Let's Go Eevee at the levels specified. Snorlax learns the following moves in Pokémon Ultra Sun & Ultra Moon at the levels specified. Snorlax learns the following moves via breeding in Pokémon Ultra Sun & Ultra Moon. Details and compatible parents can be found on the Snorlax egg moves page. These moves can only be learned in Pokémon Ultra Sun & Ultra Moon by a previous evolution of Snorlax. Check the respective Pokédex for the exact details. Snorlax can only learn these moves in previous generations. It must be taught the moves in the appropriate game and then transferred to Pokémon Ultra Sun & Ultra Moon. How do you wake up Snorlax in HeartGold/Soulsilver? Should I replace my Snorlax and with what?